If there is one thing I bloody love when I'm sat inside on a rainy day playing slots it is a slots title that is full of sun, sea, and stacked wilds. It's as if industry-leading slots developer IGT knew exactly what I wanted and decided to churn out this balmy beauty of a game. The Spirit of Carmen Miranda Lives On! 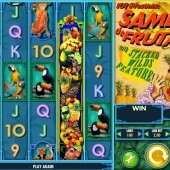 Samba de Frutas is a 5 reel, 100 payline slot that takes the essence of Latin America and shoves it right in your face to make you jealous of not living in a country that has an equatorial climate. That is unless you're reading this review and play your slots in a country that has an equatorial climate! There are a vast array of interesting symbols on this game including a female samba dancer, a male samba dancer, a toucan, a parrot, and the regular 9-through-to-Ace symbols that are presented in a range of colourful tones. 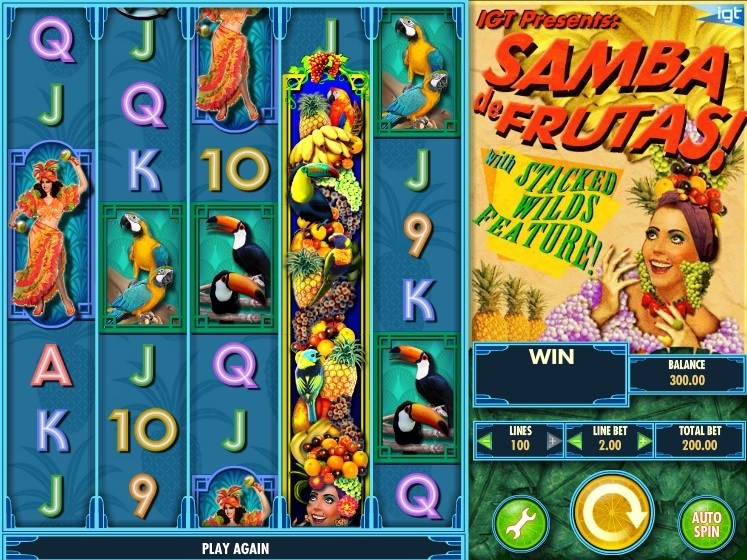 The Wild on this slot is represented by the Carmen Miranda-esque fruit hat and it substitutes for all other symbols, except for the Bonus symbols, to help complete any winning combinations across the reels. It also appears as a Stacked Wild on the reels. This means you can hit some pretty sweet wins during the base game with the Stacked Wilds alone. That certainly makes things a lot more interesting outside of the bonus feature. Speaking of the bonus feature, you will need to hit three Bonus symbols on the centre three reels to trigger the free spins. You will initially be awarded with 5 free spins. You will also earn a 2x multiplier win when this happens. It is possible to re-trigger the 5 free spins on a free spin if you hit three of the Bonus symbols on the centre three reels. Unfortunately, that is all that this slot has going for it which is quite disappointing for an IGT slot. When you consider their releases before this slot included the iconic Firehouse Hounds and the innovative Natural Powers it is quite surprising to see them release a slot that feels very half arsed. That feeling is even worse when you remember that IGT are the names behind such gems as the hugely popular Lucky Larry's Lobstermania and the all-time classic Cleopatra. Come on IGT! You're better than this!